I have a most terrible obsession with Asian food. My recent trip to Berlin attests to this. In the land of currywurst, I ate only Japanese, Vietnamese, Indonesian, and Thai. It's fair to say that the German capital has higher quality and a wider variety of offerings than Prague. Next to my hotel off Potsdamer Platz, there was an Asian restaurant called Coa. The chain, which has outlets around Germany, offers an eclectic mix of dishes that cross a number of borders. 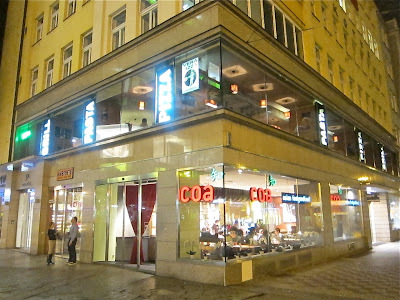 At the beginning of March, Coa opened in Prague -- its first non-German outlet. The bright, eye-catching space in the high-traffic area at Náměstí Republiky provoked my curiosity. The investment in design made me think they'd invest heavily in the cooking. There are a variety seating options. They have lounge-like banquettes. There's a small, semi-private area, separated by screens. One could select tables against walls with rough wood panels. 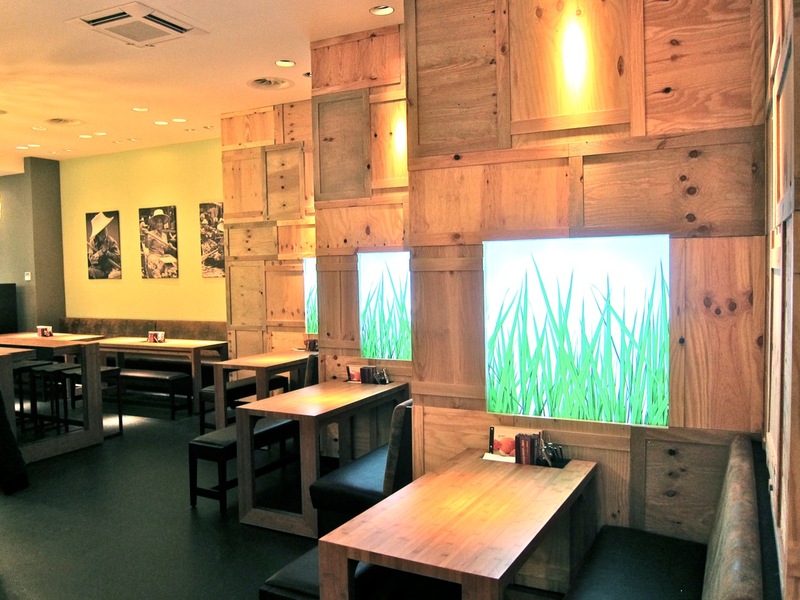 Or you could try the long tables with stools in front of the open kitchen. On my first visit with my Italian companion, we started with soup. She got "the meatless bunch" (75 CZK). This was a vegetable soup with shiitake and button mushrooms, bok choy, red chilies, and cherry tomatoes. 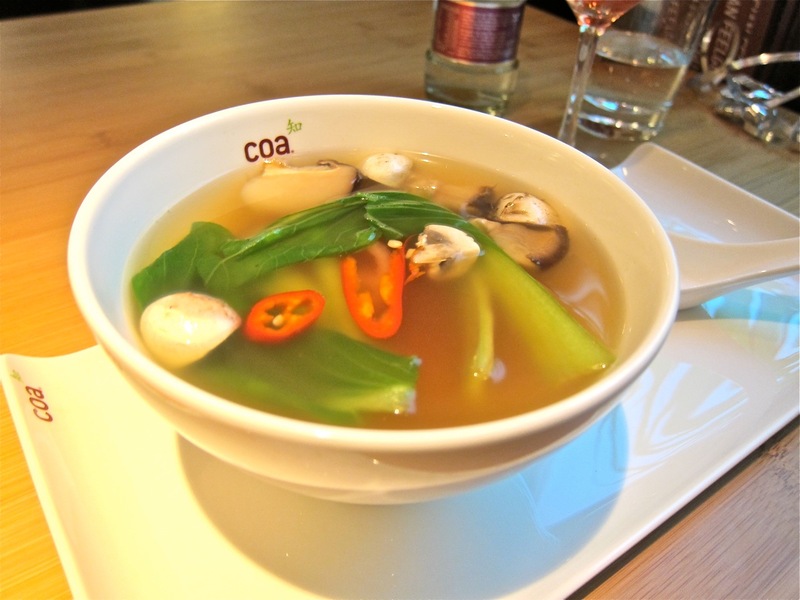 The flavorful, steamy broth had a strong shot of soy. We both liked it. 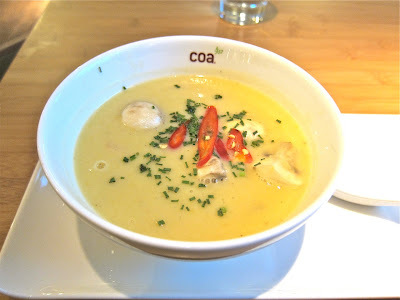 I had the pumpkin and coconut soup with prawns, button mushrooms and chives (109 CZK). It was creamy, sweet, and tangy. The coconut overshadowed the pumpkin. I thought it was good and would get it again. We both decided to drink wine, and what they serve is on the expensive side. 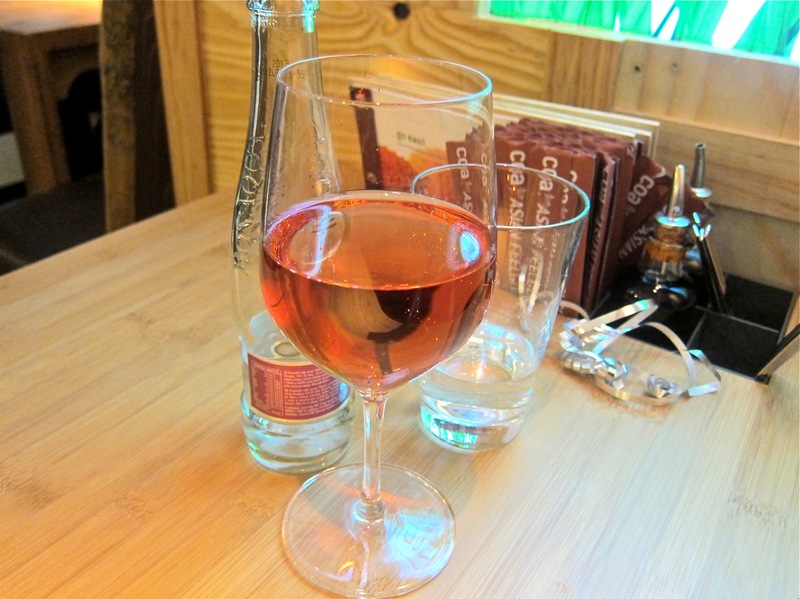 Wines by the glass are 70 to 80 CZK for .1 liter. We drank glasses of Chupin Rosé d'Anjou. It was too sweet for me. They also serve .25 liter bottles of Bonaqua (25 CZK), which I hate. Next up was what they call "Summer in a Roll" otherwise known as summer rolls. They are 95 CZK, plus a supplemental charge depending on whether you choose chicken, beef, or duck to go with it. With duck, it adds up to 209 CZK. 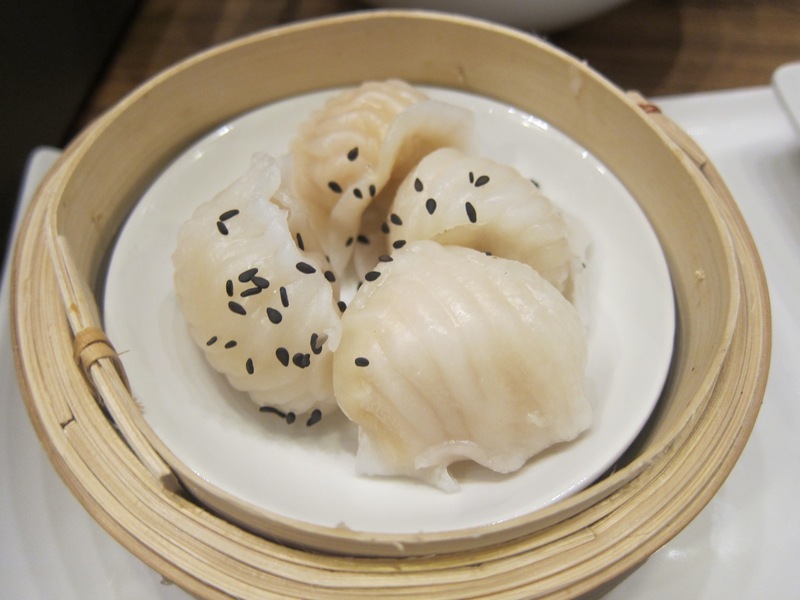 The way they serve it is more common in Asia, though I've never seen it in Europe: roll your own. 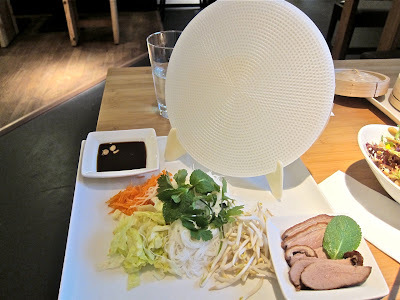 The cold, moist rice paper is held between circular, plastic mesh discs. Peal one off, fill it up, fold it up, dip and eat. They gave me three, but told me I could have more if necessary. I won't show you how mine turned out. It held together, but it wasn't so pretty. Frankly, I'd rather have someone do it for me. You can load it with unseasoned rice noodles, mint, coriander, carrot, spring onions, lettuce, and bean sprouts. There was a hoisin dipping sauce on the side. The cold duck was good and reasonably moist and fresh, but nothing too special. The small "Mango Chicken Fresh-up" (115 CZK) is basically a salad. 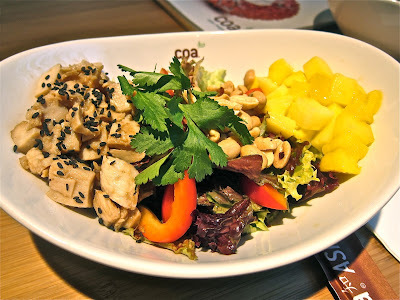 This includes hoisin-marinated chicken, lettuce leaves, red pepper, black sesame and mango-chili dressing. The menu said it came with chopped peanuts, but these were unchopped and difficult to keep on a fork. The mango was a little on the sour side and the chicken didn't have much flavor. The whole thing was awkward to mix together in the small bowl. To eat the components in combination, I decided to use a spoon. 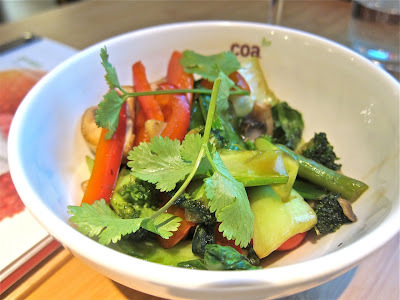 My friend got the wok vegetables, which included bok choy, broccoli, and red peppers. This was good. The vegetables retained crunch and flavor. 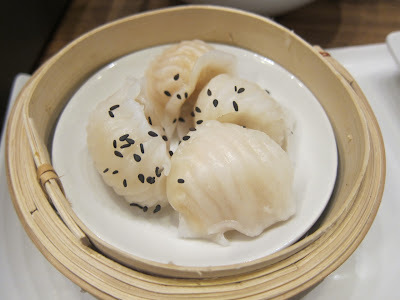 We shared a mix of 8 dim sum (159 CZK). There's the "pork and prawn meeting," "sesame pool duck," and more. 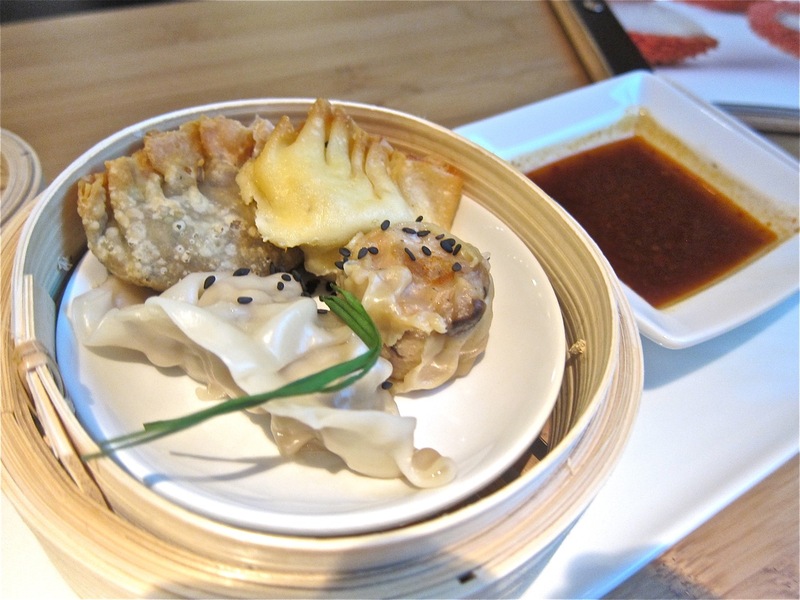 Dim sum is a rarity in Prague, and I'd rate almost all as good. We both were put off by the "sweet & creamy fusion," which was just cream cheese. 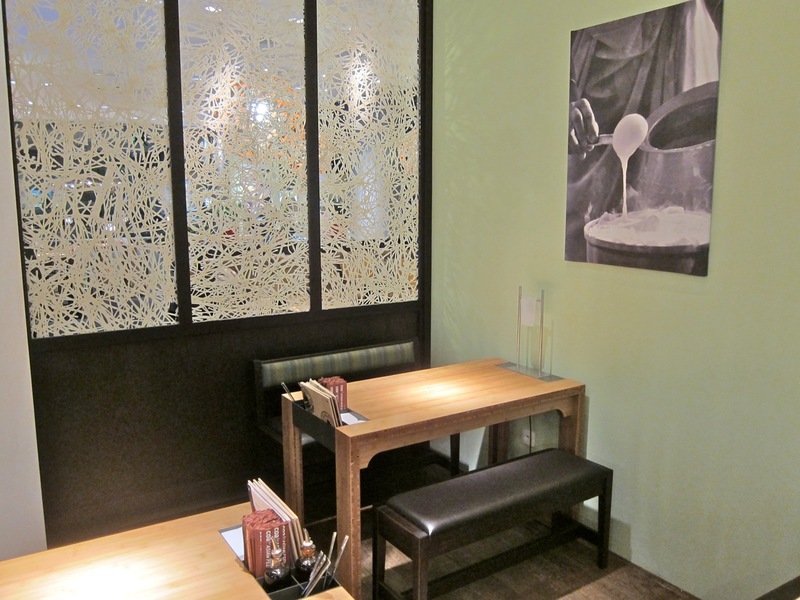 I had some room, so we ordered the "lemon beef noodle session" (154 CZK). The meat was well-marinated in lemongrass, but the beef itself was low quality. It was tough and underwhelming underneath the seasoning. The noodles were plain and unseasoned. Disappointing. 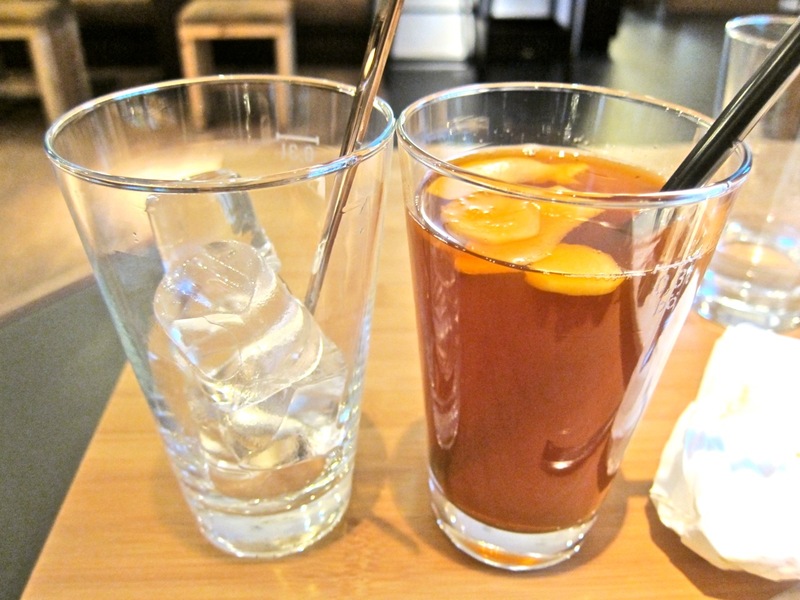 Finally, I ended with a glass of ginger iced tea. It cost around 60 CZK. It was a strong brew with the flavor of real Thai tea. Slices of ginger floated at the top, but it did not infuse into the tea. I couldn't really taste it. What I could taste was a shocking amount of sugar. I had to order an extra glass and ice, pour some of it out, and dilute it with water. Then it was drinkable. I wished they had a version with condensed milk. After this, I made a solo visit. 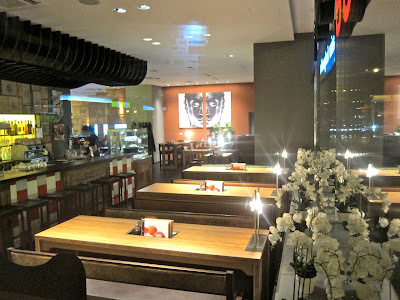 I ordered the beef masaman (255 CZK). In the bowl were sweet potatoes, broccoli, carrots, potatoes, and snow peas. Again, the beef was tough and it had an odd flavor. All was covered with a thin coconut milk curry that tasted of lime leave and provided some heat. 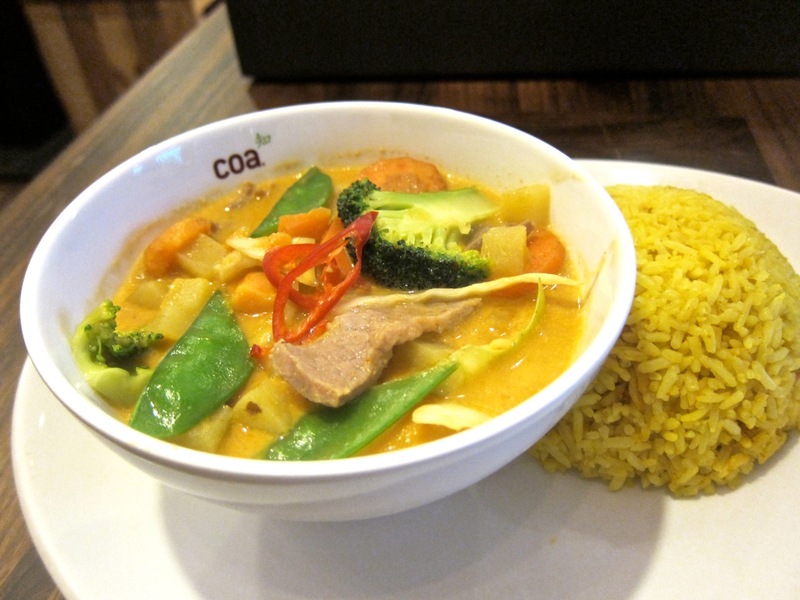 I'm always wishing the curries at Asian restaurants in Prague had thicker sauce. 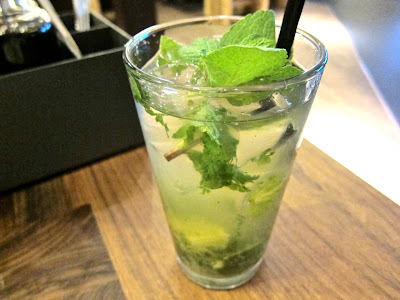 To drink, I got the "Thai basil smash," also known as the Coa Mojito (125 CZK). It was a dull, flat, and watery failure. 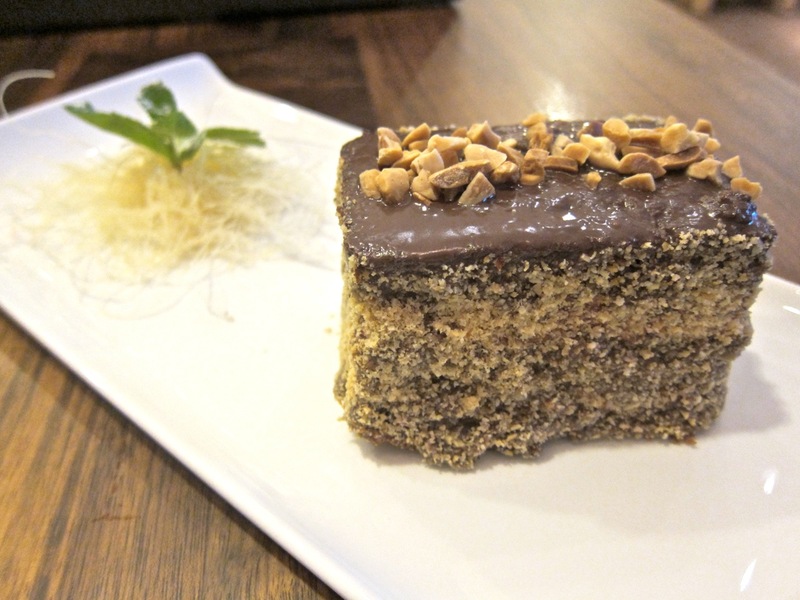 For dessert, I had the chocolate hazelnut cake (50 CZK). It was OK, but had the rather artificial quality of a mass-produced dessert. I returned for one last meal. We got the "coconut clash" or tom kha gung (97 CZK). I'd rate this as above average. 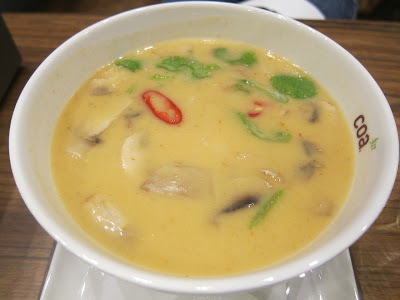 It had a good balance of sweet and sour, a little chili kick, a good hit of galangal and coriander, and a creamy consistency. The prawns were small but cooked just right. It was rounded out with mushrooms and spring onions. The "papaya prawn parade" (98 CZK) was OK. I liked the Thai chili dressing with lots of fish sauce, but it quickly pooled in the bottom of the bowl. There were too many bean sprouts for my taste. They overwhelmed the cherry tomatoes, mint, and papaya. Again, the peanuts were unchopped and awkward. The prawn package dim sum was good (108 CZK). 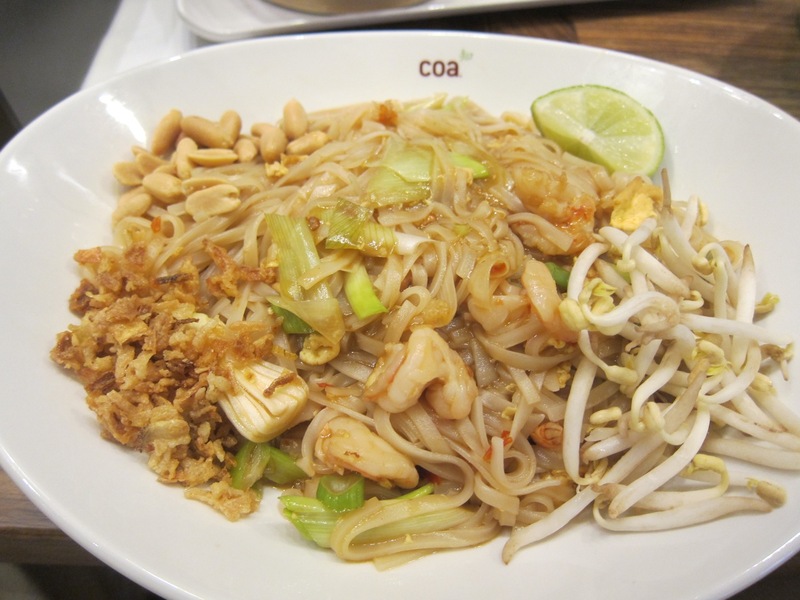 Finally, I had the Pad Thai with shrimp (188 CZK). I use this dish as a measuring stick for any restaurant that does Thai. Unfortunately, I'd rate it as another fail. The whole was less than the sum of its parts. 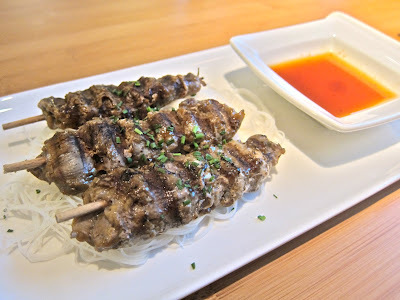 It was bland, one-dimensional, and needed more lime juice and a salty note, perhaps some fish sauce. The sliced pieces of prawn were tiny. Again I was chasing the rolling peanuts around the plate. 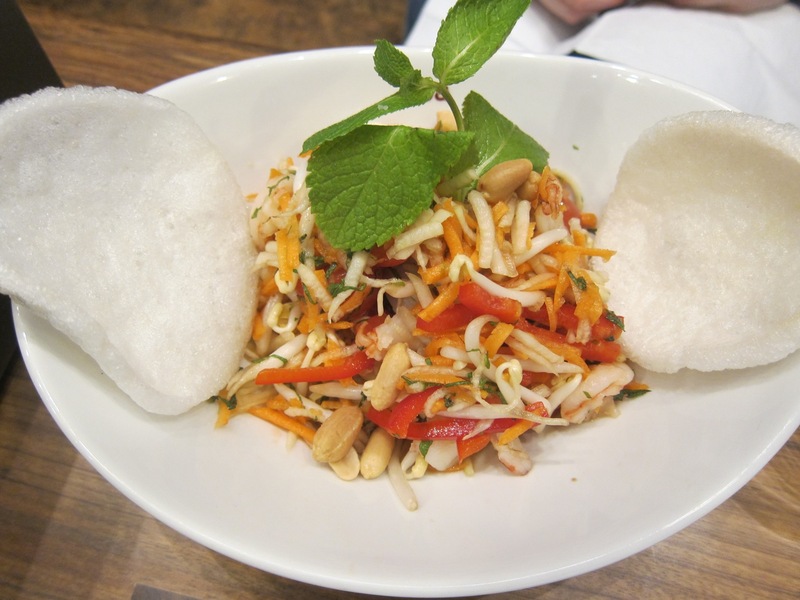 If they want a lesson on how to do Phad Thai right, they should send the chefs over to Noi. They cook the best I've had in Prague. 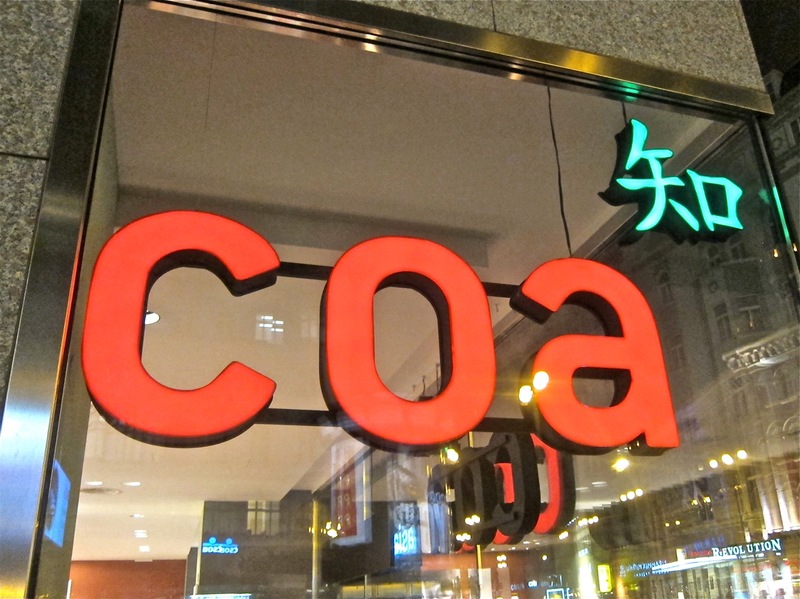 I thought Coa would turn out Asian cuisine of a higher international standard than we've become used to in Prague. Granted, I didn't try many things from their long menu, but my high expectations were brought low by a number of lackluster dishes. It's not exactly cheap, either. 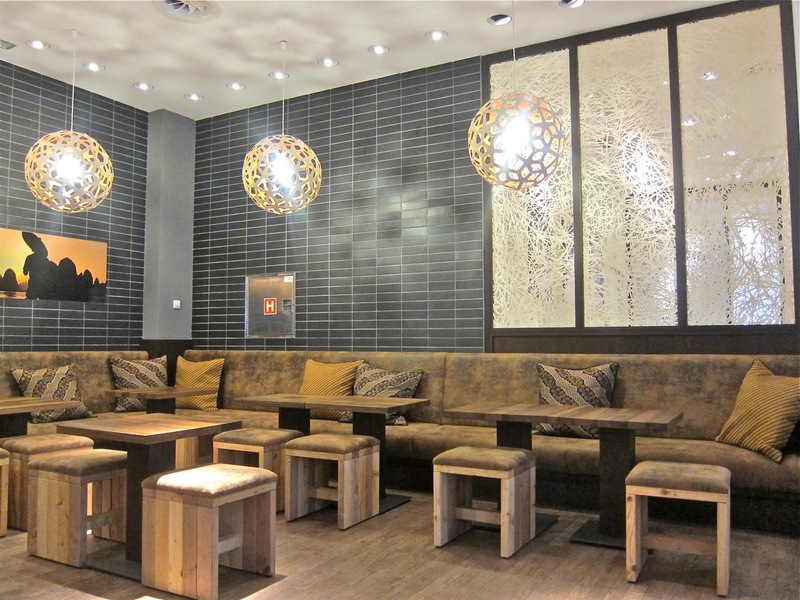 It's a new place that has a different style than we've seen before here. Hopefully with some experience and constructive feedback, they'll improve. 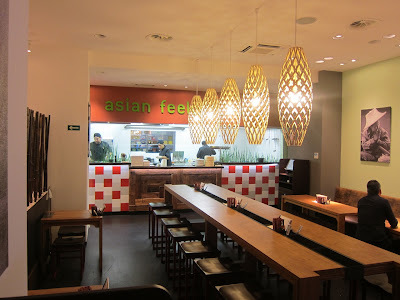 Right now, despite its fancy looks and quirky menu, I'd say most of the food I tried was most simple and most ordinary. on the choc hazelnut cake, what was that white sliced decorating thing ? raddish ? bila repa ? looks like yellowish two day old raddish.